As of last night, the Golden State Warriors are the NBA’s new Western Conference champs. 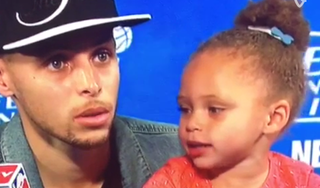 In more important news, Riley Curry made her return to the post-game podium to give a speech. Watch and aw as Riley sings the chorus from Big Sean’s “Blessings,” while her dad—guy named Steph Curry—remains serious and focused on the challenge ahead. We are #blessed. This whole family is #blessed.